Miata guy gets a free RX-8... What should I do? - Page 2 - Miata Turbo Forum - Boost cars, acquire cats. Miata guy gets a free RX-8... What should I do? Rx8 swaps aren't as easy as they seem. It has just enough tech to make it a pain in the ***. Gauge cluster is run through the canbus so you either have to keep the stock ecu, figure out a canbus converter to the ecu you have, or swap to different cluster. Unless you have a base model with the non-dsc ABS module(uncommon) ABS won't work, and you can't eliminate it because that's where the speed signal for the cluster comes from. That being said, I'd love to see someone come up with a Honda K-swap kit for the RX8, it'd be just about perfect. As for rebuild of the stock engine, if there is nothing wrong with the internals and it just needs a new set of seals, it'll run you around $1500 if you do it yourself. However it is extremely rare for the the housing to be in usable shape after a seal failure (gouging with a apex or side seal failure, corrosion with a coolant seal failure.) They also wear poorly even in a good engine. New housings are ~800-900 x2, good used are in the 500 range x2 Side plates have a better chance of surviving, and rotors too is the apex seal hasn't come apart. More realistic rebuild cost is probably in the 3-4k range, but don't forget to add some extra dollars for the replacement harness bits since they get brittle from being in a super hot engine bay all the time. Be sure to fix the issues with the stock fuel pump and catalytic converter or you'll be rebuilding it again soon. Also make sure you check the rad and coolant bottle for cracks or you'll fry your new motor. I installed a new cat/midpipe with plugs and coils years ago for the original owner. (history lesson, Mazda did not train their techs on the triangle engine *gasp* allot of engines were replaced that were "bad" but they just needed new cats and coils) (also dont get me started on how tech were "trained" how to deflood an engine. I feel bad for the starters I did this to) That is my real concern, the irons should be fine with some lapping but I thought i read years ago that the housings on the Renisis were made with inferior metal to the 13brew. And you also get points for the canbus comment. I totally forgot about when the car first came out that people had trouble dynoing it because the ECU freaked out when the rear wheels were turning when the fronts were stationary. I am comfortable wiring a car from scratch (with a megasquirt) but trying to deal with a CANbus system is over my skill level. I almost wonder if I could buy one of the cheap 4 port JDM engines on the interwebs. Then make a franken motor with my 6 port irons. The renisis has side ports so the housings could possibly swap over to the old irons? Making a running car in the process? Or just buy a JDM 6 port for $1500 or so? Lemons / Chump cars don't need Canbus. Or working OEM instruments. Or an ECU of any kind. They just need a solid chassis, the engine and transmission from some random junkyard 80s diesel, and lots of MIG wire. Whats the biggest challenge of those outside the cluster? You could try an ecotec. Dunno how you’d adapt the trans, but they’re torquey 2.4l 4 cylinders that go for $4-600. Standalone harnesses with ecu and tune are $1200ish. 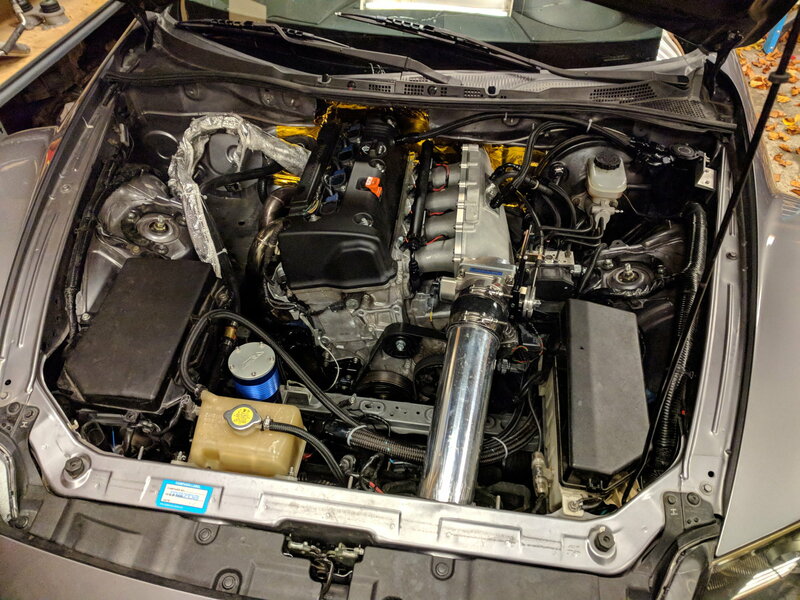 We have an RX-8 plug and play ECU that will also work with almost any engine up to 8 cylinders, drives ALL the gauges in the cluster, and has working ABS/DSC. Just saying. The 13B REW swap isn't that insane. You can use the RX8 front cover (needs to be modified) and also change some mods to the engine mounts. There is a drop in sub frame available to make the swap easier. I saw a RX8 for sale locally and looked into the swap a little. I'm no expert on it but it seemed easy enough to do. Run a standalone with CAN communication and you should be fine. You use the 8 front cover so you retain the factory accessories and for clearance. Another option for the cluster is to do a raspberry pi setup. Now THAT is something intriguing. The number of blown up RX-8s around here are growing with age. For the OP, sell it to some fool who thinks he can fix it cheap. It's likely that the housings will be worn out, so an inexpensive rebuild isn't likely. We worked with a customer to help get this done back in 2017. He loves it. Don't kid yourself that you can flip it for any amount of money. Functional condition running RX8s still rarely break the 4 figure price tag mark around here. Unless you're prepared to dump money on it, don't do it. Oof. That makes my junk tingle. Really interesting that y'all have an ecu solution that'll work with abs/dsc and canbus. Could simplify swaps a lot for applications without obd2 emissions. As you are a miata guy and this is just a toy run around go for a straight forward already done several times engine. The sort of click here to buy type package. Fit it in your spare time so you relax when doing the miata. Once done DD it for a few months to check your work then sell for a **** ton for the exocet. should I just throw away a free EMU? Quick Reply: Miata guy gets a free RX-8... What should I do?